The larger gauge model railways cover gauges 1 through 4 as well as some even larger gauges. (Essentially, the gauge is the width between the rails.) These larger gauges were best suited to the outdoors, which limited them to wealthy enthuisiasts who could both afford their high prices and who had sufficent space available to build interesting track layouts. Indeed, these larger gauges were very popular in large gardens, but it was the sheer space they needed that ultimately led to their demise. Enthuisiasts could simply achieve much more complexity with smaller indoor gauges such O/OO/HO, which led to the gradual decline of the larger gauges in favour of the smaller ones. A 5 inch gauge live steam 0-4-0 saddle tank locomotive, which was offered for auction in one of our recent specialist sales. 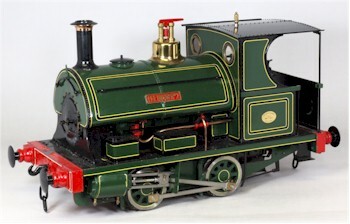 Many locomotives, carriages and other rolling stock were bespoke built by very serious model engineers with considerable skill, making them very valuable and highly collectable today. Most locomotives built in these gauges were driven by steam or compressed air and not by clockwork or electricity as their smaller cousins.